New Delhi: Shiva Gopal Mishra, Secretary, National Council (Staff Side) JCM, for Central Government Employees has submitted fifteen important items for inclusion in the agenda for the National Anomaly Committee meeting based on 7th CPC Anomaly on August 16, 2017 to Dy. Secretary - JCA, Department of Personnel & Training. Time had come to grant parity between similarly placed personnel employed in field offices and in the Secretariat and this parity would need to be absolute till the grade of Assistant". The Commission accordingly strongly recommends parity in pay between the field staff and head quarter staff upto the rank of Assistants on two grounds - firstly the field staff are recruited through the same exam and they follow the same rigours as the Assistants of CSS and secondly there is no difference in the nature of functions discharged by both...."
Denial of the same pay scale to field offices as of those cadres upto Assistant SO in CSS is in violation of the principles enunciated by the 7th CPC that cadres and categories having similar recruitment qualifications must carry identical pay scales. This also is causes horizontal relativity between the pay scales of field level staff and those of CSS. 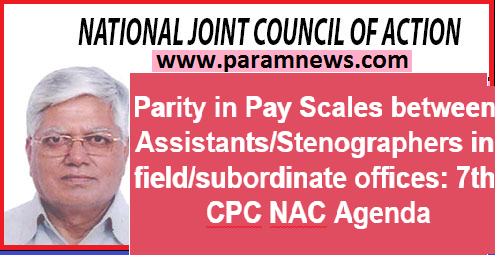 Denial of the same pay scale to field offices as of those cadres upto Assistant SO in CSS is in violation of the principles enunciated by the 7th CPC that cadres and categories having similar recruitment qualifications must carry identical pay scales.